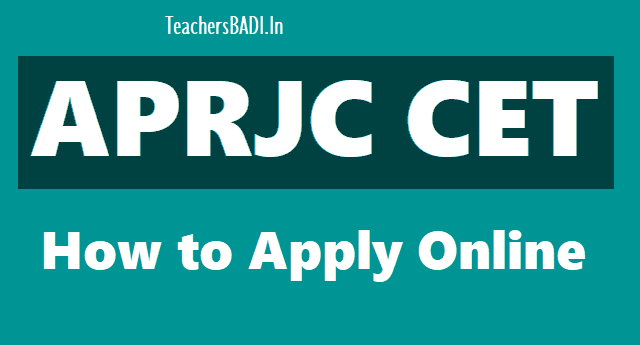 APRJC Common Entrance Test 2019: APRJC CET 2019, APRJC Entrance Test 2019, APRJC Admission Test 2019, Apply Online on www.aprs.cgg.gov.in: Andhra Pradesh Educational Institutions Society has issued APRJC Common Entrance Test 2019 Notification in March 2019. APRJC CET 2019 Exam for Candidates seeking admission into Inter I year in 10 AP Residential Junior Colleges and College of Excellence ( Center for Competitions) in the campus of APRJC Nagarjuna Sagar, Guntur Dt for the academic year 2019-2020. APREIS is inviting the online application form from the eligible candidates for admission into Intermediate courses in its APRS Junior Colleges. Selection of Process: Selections of the process through Entrance Test. Selection of students will be made based on the merit in Common Entrance examination, Reservation, Special category and Local area. While selecting the students for MEC and CEC Group, combined rank will be given to the candidates opted to MEC and CEC. If a candidate opted to MEC is not selected for MEC, his/her candidature shall be considered for CEC also and Vice versa. 2. The candidate after satisfying himself/herself about the eligibility criteria for the submission of application through online shall pay a fee of Rs.150.00 through APONLINE or mee-Seva from 15.03.2019 to 10.04.2019 for submission of application through Online. The AP Residential Junior Colleges were started by the Government of Andhra Pradesh in fully residential and ‘Gurukul’ pattern with an aim to cater to the needs of the talented students in the state at + 2 level.